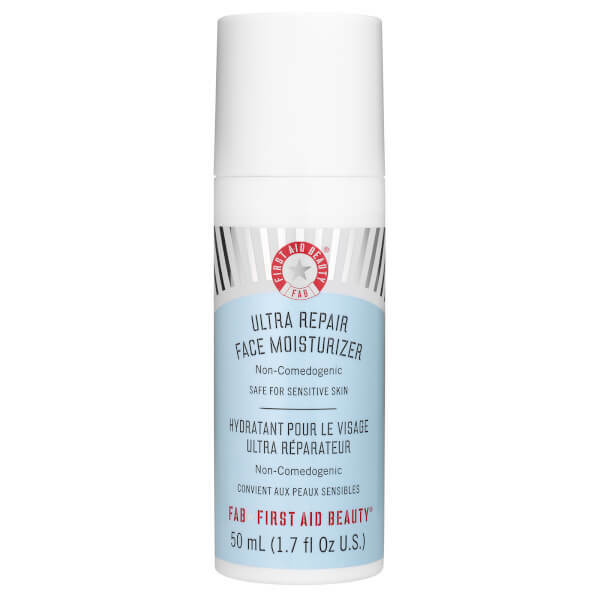 Luxurious and nourishing, the First Aid Beauty Ultra Repair Face Moisturizer brings all the goodness of 'FAB Ultra Repair Cream' in the form of a lightweight moisturiser. 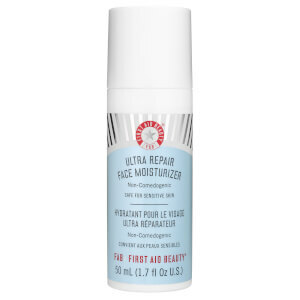 Perfect for those with normal to dry skin, the quick-absorbing formula deeply moisturises with a blend of shea butter and avocado oil whilst protecting the skin's barrier function with ceramides. Super-hydrating with a natural synergy of waxes and essential oils, the miracle formula will leave your skin feeling velvety soft and supple. - K.N. *Free from parabens, harsh chemicals and colourants. Safe for sensitive skin. Apply each morning and night after cleansing. Water, Glyceryl Stearate SE, Glycerin, Caprylic/Capric Triglyceride, Colloidal Oatmeal, Urea, Squalane, Dimethicone, Cetyl Alcohol, Cetearyl Alcohol, Caprylyl Glycol, Phenoxyethanol, Allantoin, Butyrospermum Parkii (Shea) Butter, Limnanthes Alba (Meadowfoam) Seed Oil, Persea Gratissima (Avocado) Oil, Carbomer, Sodium Hydroxide, Camellia Sinensis (White Tea) Leaf Extract, Chrysanthemum Parthenium (Feverfew) Extract, Glycyrrhiza Glabra (Licorice) Root Extract, Ceramide 3.